Yearbook grading questions? We’ve got answers! We know that grading a yearbook class isn’t always straightforward. There’s so much to consider and many factors you don’t have in other classes. We’re here to help with our newest resource for yearbook advisers, Sooo… How am I supposed to grade a yearbook class? Download your copy to learn from four experienced advisers who have found the system that works for them. We’ve also included resources from these advisers, including a grading rubric. Lynn Bare, of Southern Alamance High School in Graham, North Carolina, realized the need for an objective grading method early in her career. She has spent the past two decades developing the method for her yearbook class. Bare uses rubrics to evaluate the many tasks and sections her students complete. She has found success, but is still prepared to modify her methods as needed every year. Leland Mallett, CJE, of Legacy High School in Mansfield, Texas, openly proclaims his distaste for grading, but still needed to grade his yearbook students. He’s set up a grading system that tracks student progress week by week. Mallett’s grading solution makes it possible for students to easily track their progress as the semester progresses. Vena Geasa, of Eleanor Murray Fallon Middle School in Dublin, California, has used the Habits of Mind system in her art classes for many years. This year, she started using Habits of Mind in her yearbook classroom, too. Habits of Mind allows Geasa to grade students based on effort and dedication as opposed to tasks and natural ability. It allows student accomplishments that don’t occur on paper to influence their final grade. Renee Burke, MJE, of Orange County Public Schools in Orlando, Florida, is known for her meticulous grading system. She’s a familiar face at yearbook conferences and workshops. Over her 20 years at Boone High School in Orlando, Florida, she developed a grading system using story planning, mini-deadlines, progress-tracking and task breakdown to help her students succeed while creating multiple award-winning yearbooks. Each of the four advisers interviewed for Sooo… How am I supposed to grade a yearbook class? shares the methods that work for them, but doesn’t assume their exact method will work for everyone. We want you to find the method that works for you, your classroom and the school year. Each example is just a starting point. We hope you’ll use these ideas, but also talk with your rep, adviser friends and mentors to learn more about what is best for you. 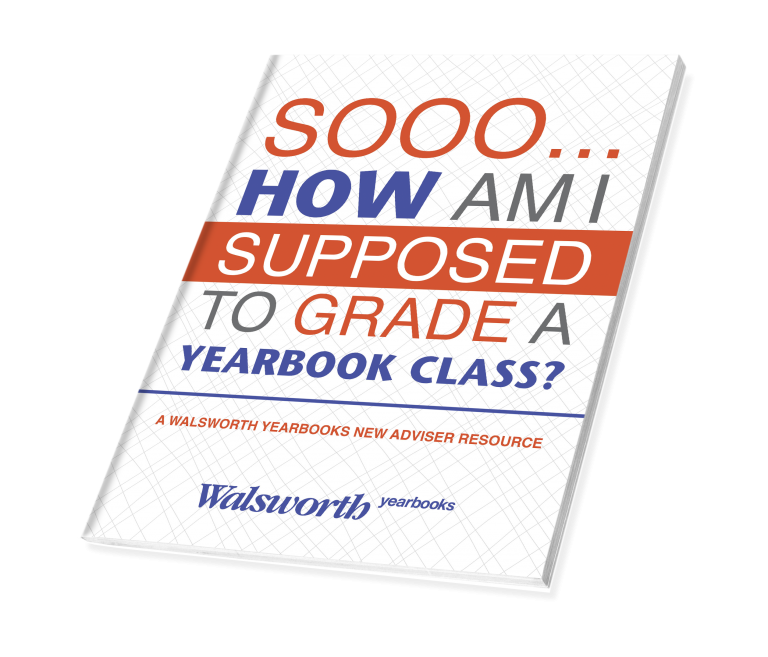 Download your copy of Sooo… How am I supposed to grade a yearbook class? at walsworthyearbooks.com/ebooks. Be sure to explore the many resources we have available while you’re there? If you’re a new adviser, don’t forget about our resources just for you. We know the pressure is on as that first big deadline approaches, and will do everything in our power to make your first year a success, starting with the new adviser resource page!